I’ve finally managed to do something in the world that has an impact. It’s called Trip Tracker. I work for Boulder Valley School District’s Transportation Department. For almost everyone, school district transportation departments mean yellow school buses. BVSD, amazingly enough, has two of us working on reducing car trips to school any way we can. I think that’s very neighborly of the school district to put energy into reducing car traffic, particularly around school zones. I dreamed up Trip Tracker three years ago while managing a grant to get more students in carpools and on RTD buses. That grant was only minimally successful because I didn’t have a way to interact with kids and families in a big way. I realized that I needed to come up with a way to reward students for not coming to school in cars, a way that wouldn’t add work to school staff or financial burden to the school. 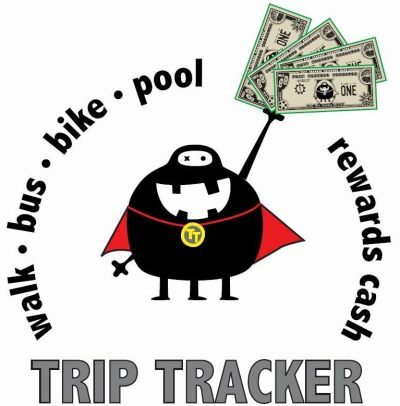 Trip Tracker rewards kids for walking, biking, skating, scooting, carpooling, riding the RTD or riding the school bus. They get one Trip Tracker Dollar for every four trips and another dollar for every ten miles of active transportation (walking, etc.). They can spend those dollars like cash at 40 local businesses and I buy them back with fundraised dollars at 50 cents on the dollar. This arrangement seems to be sustainable for the businesses as I’ve only had two of them have to drop out of the program over the course of the program. Businesses are chosen from recommendations by kids and their parents and occasionally a parent who owns a business offers to participate. The fact that I only add ‘local’ businesses is an important piece of this, at least to me. It makes the program very community based, circulates money within the local community, and gives businesses a way to be seen as actively caring about the place they live in. Parents tell me regularly how much they appreciate the businesses that participate and they show it by spending real money with them. Now, back to impact, I collect trip data through monthly surveys to the parents. They report trips, I crunch the numbers and we take boxes of dollars (counted out by school bus drivers back at the office) in individual reward packets to participating school cafeterias for distribution by parent volunteers once a month. Talk about impact, that cafeteria distribution creates all the school marketing I need as kids swarm the distribution table, show off their loot and the list of where they spend it (think Glacier Ice Cream, Gateway Fun Park, Lucky’s, Alfalfa’s, Spruce Confections, the Bookworm, Play It Again Sports…). Every year in March I put in a question to evaluate Trip Tracker’s effectiveness. This year’s version was “We need to know what effect (if any) Trip Tracker has on the number of times per week this student is driven to school. We can’t know that without asking you.” It then gives choices ranging from “0%-No effect” to “100%-We used to drive both ways every day but now we don’t drive at all.” Using the percentage reductions that parents give and already knowing how far each student lives from school (transportation keeps those data), I can project the number of trips per year saved and the mileage. I get roughly the same response every year I ask this question. Roughly 1/3 of respondents say that the program has no effect on number of trips (although their kids love it) but the other 2/3 report an average reduction of 40%. That means on average they make 4 fewer car trips to and from school per week. Trip Tracker is in 17 schools this year and there are over 2,000 students actively participating each month. The year before, Trip Tracker was in 11 schools and the year before that in 3. This year we are able to project a reduction of 191,000 trips and 568,000 miles of driving. That’s the impact I’m talking about. While those are nice chunky numbers everything is relative and they’re only a small fraction of all the car traffic associated with schools. Open enrollment is a mixed blessing at best. This year, 36% of BVSD students are open enrolled and that usually means that they don’t live near the school they attend. The average distance to school for the district’s 28,000 students is over three miles. Hmmm…do the math, 170 school days per year means 340 trips back and forth, multiplied by 28,000 students times three miles. The average student travels 1,020 miles per year to school and back and when you multiply that by 28,000 you get 28,588,000 miles of travel back and forth to BVSD schools per year. That’s an inspiring number but one should always ask, “So what?” Answers come quickly if you hang out and observe near a school at the beginning or end of the day. That’s easy for me because I live four doors down the street from an elementary school. I see a line of cars twice a day that extends down the block and around the corner waiting to get as close to the school door as possible for drop off or pick up. I can’t get out of my driveway. I see parents sitting in their cars with their engines running, chatting away on their cell phones at some schools for up to 20-25 minutes. I see near misses every day as kids get let out on the wrong side of the street and dart through traffic and lines of idling cars with distracted drivers. Here’s another interesting factoid—according to the Colorado Lung Association, one minute of idling your car spews out an amount of carbon monoxide equivalent to the smoke from three packs of cigarettes. That creates an invisible cloud of harmful toxins for your children to breath while they’re standing there waiting for Mom or Dad to idle their cars up the line to where they can pick them up. What I don’t see enough of is walkers and bikers. That is a lost opportunity for a bit of start-of-the-day exercise and fresh air for kids who, as a group, get less and less of it…ah the seduction of little screens, big screens, all sorts of screens with interactive games. Research now confirms that walking and biking to school improves academic performance at school. Door to door shuttling in the family car does not. Why do we do this to our children? I’ve had the benefit of researching this question a number of times and I have a pretty good idea but you probably wouldn’t be surprised by the answers. They can be clustered under categories like, convenience, time saving (convenience again), fear and ignorance. I suppose that the basic answer is the perception that everyone else drives their kids so that must be the way to do it. Parents choose their battles with their kids and tend not to choose the battle of “You’ve got to get up earlier so you can walk, ride, bus or carpool to school.” Perhaps we’ve also gotten a little over-protective. I won’t bother you with “when I was a boy” and walking to school in sub-zero temperatures, but it’s fascinating to see how relative all of that is. I hear regularly from parents that Trip Tracker dollars are enough to get them out of bed in the morning and that their kids won’t allow them to drive them on cold, snowy days anymore. They don’t want to lose out on earning their bucks. I also hear that kids who wouldn’t be caught dead on a school bus now happily go to school that way for the same reason, ditto for carpools. For many families, Trip Tracker has highlighted the importance and benefits of not driving to school. It provokes dinner time conversations about how cars impact the environment and how walking and biking actually feel like a good thing to do. Kids learn that it’s important enough that someone wants to reward them for doing it. Occasionally a parent refuses to have their child participate in Trip Tracker. They feel, rightly so, that the rewards of walking and biking are intrinsic and kids should just do it without external rewards. Right on, but unfortunately I don’t think that the appeal to virtue and intrinsic rewards will get us a cultural shift in transportation behaviors. I think it’s a question of “carrots and/or sticks.” You can either make it painful for people to drive their kids to school or you can reward them for not driving them to school. Personally, I don’t think as a society that we’re ready yet to go the route of making it painful. That usually means making it either too expensive or massively inconvenient…think closing streets around schools to all but emergency vehicles and people who live there. It’s easier to reward the kids who already participate in the desired behavior, use them as a magnet to attract kids who want the rewards but get driven every day and let them work the magic of whining on their parents. Another interesting phenomenon in all this is that once kids get the message they start to point out to their parents that they drive too much in general. There it is folks, we get change by going through the youngest, not the adults. We’re too stuck in our habits to willingly change and need to get tortured into it by our children pointing out our various hypocrisies. It works, thank goodness. What’s next for Trip Tracker? I think that we’ve just begun. Obviously, school traffic hasn’t gone away. I’m convinced that we could, at the least, cut it in half with a little help from some engaged parents. I’ve got a school in mind to target with a campaign. I’m going to tell everyone who is sitting in that line in front of my driveway that it would be quicker and healthier for everyone involved if they’d just go park in the neighborhood and walk ten minutes into school and ten more minutes back to the car with their kiddo. They’ll get to see and hear all sorts of marvelous things along the way and if they walk at least a quarter mile each way I’ll count it as a trip for Trip Tracker and reward their kids. The principal is going to tell them the same thing. I’m now rewarding staff in Trip Tracker schools for the same behaviors and encouraging them to promote the program to their students…culture change. Together we can do it. Some big thank-yous are in order. Thank you to the school district for paying me to do this wonderful work. Thank you to the City of Boulder, Boulder County, Denver Regional Council of Governments, School PTOs and individual parents for significant cash support to help buyback those dollars from the businesses. Thank you to my boss, Bob Young, the Director of Transportation for the school district for getting that it’s not all about school buses and providing encouragement and support. Thank you to the businesses that make the program possible and the wonderful parent volunteers who get those dollars into kids’ hands at school. 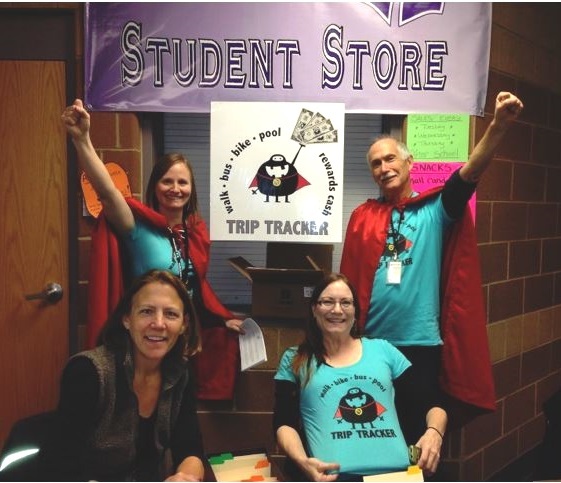 Trip Tracker continues to grow thanks to a grant from the Federal Highway Administration to expand it to all the elementary and middle schools in Louisville, Lafayette and Longmont (St. Vrain Valley School District).